So I got my pattern and mock up fabric a few days ago and decided I should give it a try. The sewing was pretty simple, but when it came to trying to get in there, it was absolutely IMPOSSIBLE. I can't even tell you how many times I attempted to sew it up and I doubled the tread and ran it through bee wax to make it stronger, but it keeps ripping . 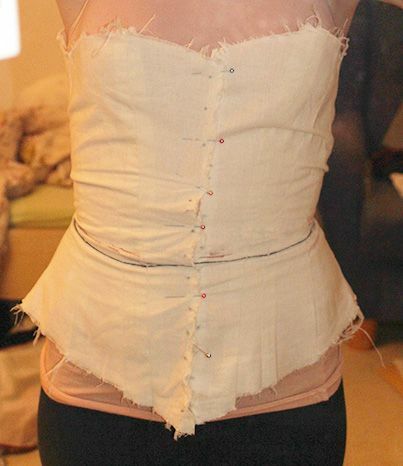 I know that I'll probably have to cut a larger bust size and make it shorter, but I'm quite happy with waist and hips. I can try and put up pictures of my mock up, but it is not going to fit me right if I only hold it. Well, my excitement for this corset is slowly fading. A last question would be if it's better to go up a cup size or change the letter for the bust. Thank you in advance. Have you tried just pinning it closed? And you did put add a panel the center back to fill in the gap? Before you go changing anything, I would cut a larger strip for the back gap. Corsets have to be too small, or they don't fit later. (But it is nearly impossible to fit something that is too small. So don't let this part get you down.) Then try the mockup on again and see how the lengths looks and such. Then, I would go back and measure yourself again. Most people start out with faulty measurements, and that gums up the whole thing from the very beginning. I have a blog page devoted to just taking the bust measure here, http://www.trulyvictorian.net/blog1/blog2.php/taking-your-measurements. If you get a different bust measure than what you had before, then you know that you will need to select a different size for the bust. How the cups fit will determine if you need more cup space or more rib space. If you need cup space, go up a cup size or two. If you need more rib space go up a corset size. Thanks for the advice, Heather. So, I changed the back panel from 3 inches to 5 inches and now (after a 30 min fight) I managed to pin it. At the moment the bust feels fine but I'm afraid it going to be way too tight when properly laced and it is the other way around for the hips. Now it feels loose but later on it should fit, right? Also, it is almost like an overbust corset on me (you can't really see because it's all bunched up) and I know that I'm shortening it. Are you supposed to do that only at the top or also at the hips? Yes, that is definitely too tall for you. With both arms up in the air, it is hard to tell how the bust area fits. But it looks ok. It looks like you need about 1" shorter at least. As it sits now, I would take all of the height off at the top. If, when you dorp your arms, you bust point drops lower, then would split the shortening to some at just above the waist, and the rest at the top. I do think the hips look a little bit too big, but it doesn't look overly long to me. It needs to be short enough that the front edge will not poke into your thighs or pelvis when you sit down. So, sit in a hard chair, and see what happens. Try to get the hip pulled down first, to get an more accurate idea of what is going on. If you need to shorten the hip, do it. OK, back to the overall size thing. I think the bust and waist look good, and the hip looks big. But, you have a huge gap in the back. Which leaves two options here. Well maybe three. 1. Leave the bust and waist as is and make the hip smaller. This would be best if you feel that the wider gap in the back it OK. Your corset fabric will stretch some, but your mockup has most likely stretched already, so you might end up exactly with the back gap you have now. My corsets tend to stretch quite a bit over time. If I start with a 3-4" wide gap newly made, I will end up with a 1-2" gap after several wearings. The biggest issue I see with corsets is a perfect fit brand new, and then a couple wearings later, it is too big. 2. Leave the hip and waist the same, and increase the bust one size (not cup size, but overall size) This would be best if you feel that you can shrink your waistline smaller with tighter lacing. Often, lean body types do not have a lot a squish factor, and do not always get a lot of waist reduction. Every body is different in this regard, so you have to judge yourself how your body will respond to corseting. 3. Leave the hip the same, and increase both the bust and waist one size. This would be best if you want a smaller gap at the back, and do not feel that you will achieve a lot of waist reduction. If this is your first corset, and you have no idea how you body will change with lacing, then I am thinking this might be your best route. There is the possibility of the corset being too large in the end, but as you have a 4" gap at the moment (5" strip less seam allowances, yes?) I think you will end up with a 1-2" wide gap eventually. As you are a lean build, this small gap would be better for you. A larger frame person I would suggest going with the larger gap.